Antibodies provides a defensive mechanism against all pathogens (antigens). 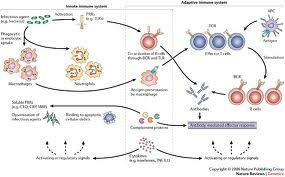 Any destruction to the antibodies can result in the autoimmune diseases. There are many functions of autoimmune system, which may also have varied effects. An autoimmune system can slow down the destruction of any cell or a tissue. There are two types of autoimmune diseases i.e organ-specific and non-organ specific. Organ-specific autoimmune diseases include Type-1 diabetes, pernicious anemia and chronic hepatitis. Non-organ specific autoimmune diseases include rheumatoid arthritis, lupus and multiple sclerosis. Autoimmune diseases can be cured if proper medication is prescribed.